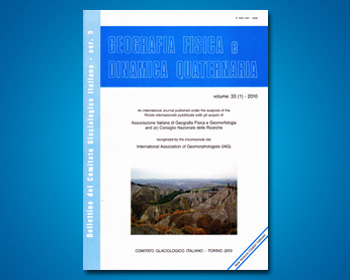 PELFINI M. & GOBBI M.
Forni Glacier is the most important Italian valley glacier and could be considered to be a new geomorphosite because of its richness in natural elements, geomorphologic evidence and the co-presence of historical elements. Scenic, cultural, socioeconomic and scientific attributes are well represented. Scientifically, geomorphologic evolution, didactic exemplarity, paleomorphological evidence, and ecological support are among the most significant aspects. In this paper we highlight the ecological value of Forni Glacier using arthropod communities as biological indicators. We collected supraglacial arthropods with different wing morphological characteristics from the glacier surface and lateral moraine. Some wingless insect species known to be very sensitive to environmental changes could contribute proxy data related to climatic change by living on supraglacial debris. Here they prey on flying arthropods drifted by upward winds; they therefore strictly depend on Glacier evolution and support the glacier’s ecological value.